The Insider Program for Windows features four different rings -- Skip Ahead, Fast, Slow, and Release -- that determine which build of Windows 10 is available to the device. 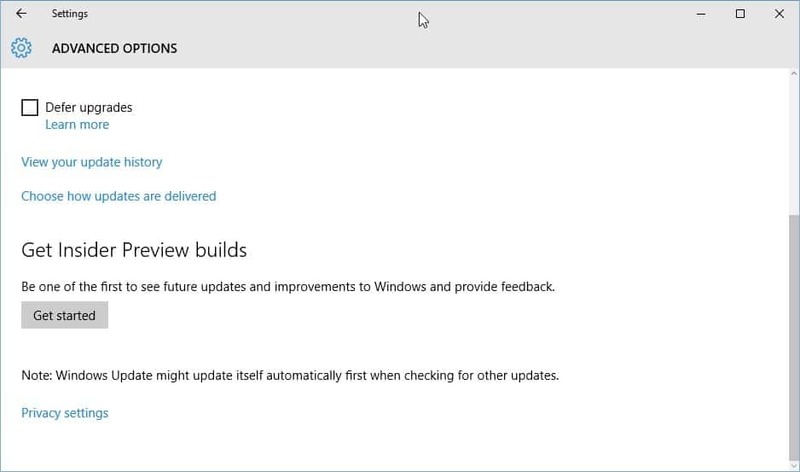 Skip Ahead -- Not open all the time, build of the next feature update that Microsoft is working on and not the soon-to-be-released one. Fast Ring -- Latest builds of the soon-to-be-released Feature Update. Slow Ring -- Same as fast, but not nearly as many builds and not latest. Release Preview Ring -- Closest to current release version, last test before a release is pushed to Stable systems. Could be preview of a cumulative update or new feature update right before release. Skip Ahead -- Will receive Windows 10 20H1 builds (Windows 10 2003), Windows 10 version 1909 is skipped. Fast Ring -- Will also be moved to Windows 10 20H1 and not 19H2. Slow Ring -- No changes. Release Preview Ring -- Will receive the May 2019 Update soon. Unclear if devices will receive the April 2019 Cumulative Update firsts but considering that the update will be released next Tuesday, it seems unlikely. In other words: if you are on the Fast Ring, you need to move to the Slow Ring or Release Preview Ring if you don't want to make the jump to next year's version of Windows 10 yet. Microsoft plans to release "19H2 bits" to Insiders later this year. Have been an insider for the last couple of years. Overall experience in the fast ring has been good usually with a couple minor bumps that require a rollback early in each cycle. Not sure that I want to jump out quite so far. Expect that I will drop to slow ring to see how Microsoft firms up their plans and then pop back to fast ring a little later in cycle. ……testing ground for bugs and issues = Windows 10 is a bug ! Not as many as you might think. I have to say that I have experienced very few of the bugs that have been highly publicized. May be luck or just the fact that, as a techie, I throw a reasonable amount of machine at this.